Nose: Complex and aromatic, yet well balanced. Aromas of lily and orange bark. Palate: Fresh and round. Gourmet finish with notes of nuts and exotic fruits. A very natural cognac. The Normandin Mercier Vintage 1976 Cognac is one-of-a-kind vintage. Not only does it originate from a memorable year in the history of Cognac creation, but it is also one of the most natural and respecting of production methods. This ultra-rare Petite Champagne spirit is a single-vineyard, single-vintage product of the outstanding harvest of that year. Bottled just outside of La Rochelle, the Normandin family brought the fine fruit of this harvest to life on the 10th May 2016 in their family cellars, producing 896 bottles from the whole cask. It was created using only the most traditional methods of Cognac production, and is a pleasure that once finished, will not be repeated. Each year the vintage barrels are unsealed to take a hundred bottles, and 1976 was a memorable year in terms of its hot, dry climate. The eaux-de-vie that was produced was rich, with a highly charged concentration of aromatic quality. Enjoy the fruits of the past with this unique vintage. 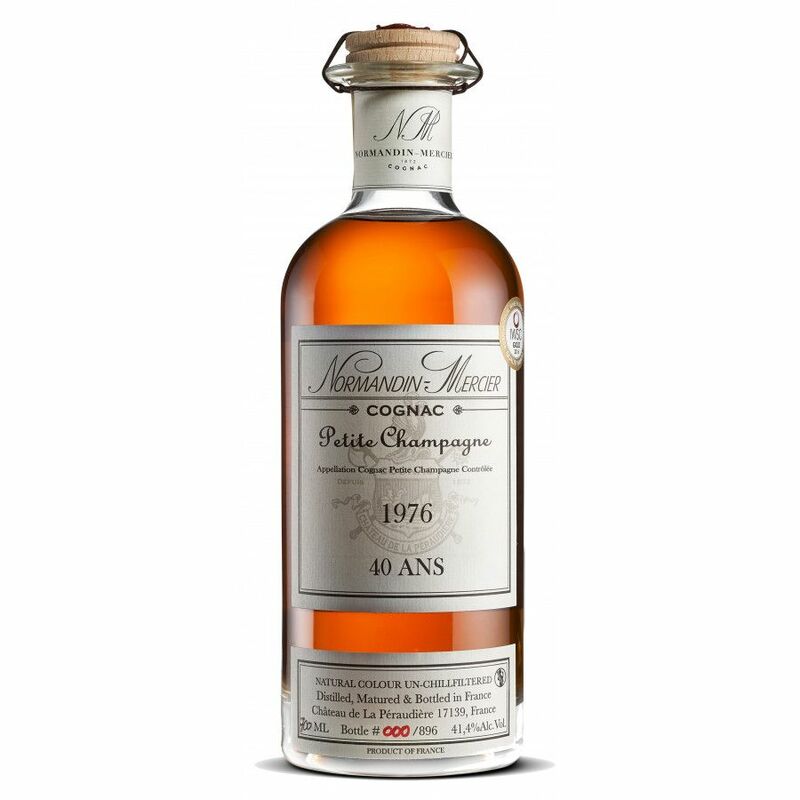 As with other Cognacs in the Normandin Mercier collection, the Normandin Mercier Vintage 1976 is aged in hand-selected wood from the Tronçais forest, and then transported outside of La Rochelle to age 8 years more. Traveling from the rich vineyard, to the oaky forest and then to the sea brings along an exquisite set of aromas and flavors. The Normandin Mercier Cognac house has built its reputation on the quality of its Cognacs from the Grande and Petite Champagne Crus; and for good reason. Their traditional methods have shown time and time again that they respect the production of this precious spirit. They add no extra colors, use non-chill filtering and respect the manual labour of this craft. Take a closer look at the Normandin Mercier estate here, on our blog. This exceptional Cognac was awarded a Gold Medal at the International Wine and Spirit Competition 2016, and each step of the production process was monitored by the BNIC.